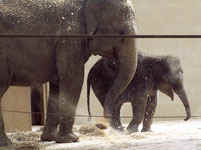 2011 list of the Ten Worst Zoos for Elephants, released today by In Defense of Animals (IDA), once again exposes the hidden suffering of elephants in zoos, where lack of space, unsuitably cold climates and unnatural conditions condemn Earth’s largest land mammals to lifetimes of deprivation, disease and early death. The list is in its eighth year. A promising trend toward the closure of inadequate elephant displays continued in 2011 and includes zoos that have appeared on IDA's annual list. The most recent are the Central Florida Zoo and the Southwick’s Zoo (Mass.). The Toronto Zoo’s appearance on the 2009 list sparked a campaign that has led to the closure of that exhibit in 2012. This brings the number of zoos that have closed or will close their elephant exhibits to 22, and zoo experts report that the number is expected to rise. Another result of IDA's relentless advocacy for elephants in zoos has been the creation of an historic management policy by the Association of Zoos and Aquariums (AZA) that calls for an end to handling that requires keepers to share the same unrestricted space with elephants. If the AZA is serious about enforcing this policy, it will pave the way for an end to the use of the bullhook, a weapon used by keepers to threaten and to often inflict painful physical punishment. "IDA's Ten Worst Zoos for Elephants list illustrates the many serious problems that condemn elephants to lives of misery in zoos," said IDA Elephant Campaign Director Catherine Doyle. "These include abnormal repetitive behaviors, hyper-aggression, social isolation, and deadly conditions such as foot and joint disease caused by lack of space and movement." "Scientific research has shown us what elephants need: the space to walk miles every day, large families with whom to spend their lives, and rich natural environments," said Doyle. "Caging elephants in zoo displays is not humane and it is not conservation." 1. Edmonton Valley Zoo (Alberta, Canada) – Solitary misery. Things couldn't get much worse for Asian elephant Lucy who is confined all alone in a tiny exhibit, despite the profoundly social nature of elephants. As a result of keeping her in one of the most inhospitable climates imaginable for an elephant, Lucy suffers foot disease – the leading cause of death for elephants in zoos - and a chronic respiratory problem. 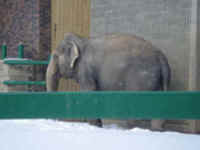 Despite a lawsuit that may end up in front of the Supreme Court of Canada in 2012 and worldwide calls for Lucy's release to a natural-habitat sanctuary in a much warmer climate, the Edmonton Zoo selfishly keeps her alone and in distress. This is the Edmonton Valley Zoo's second appearance on the list, up from the number two spot last year. 2. Reid Park Zoo (Tucson, Arizona) – You can't get more cold-hearted than this. This zoo has a cruel plan to separate Connie and Shaba, who have been tightly bonded for 30 years. Why? Because Connie, who is Asian, does not fit into the zoo's new African-themed attraction. African Shaba will remain, though if she doesn't integrate with the breeding group coming from the San Diego Zoo Safari Park, she'll be sent to another zoo. Zoos often separate bonded elephants, causing profound suffering, and ship them between zoos like furniture. 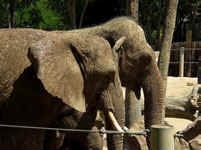 The Reid Park Zoo prefers to ignore the reams of scientific research attesting to the deep and often life-long connections that female elephants form in favor of driving up attendance and revenue. The Reid Park Zoo makes IDA's list for the second time. 3. Buttonwood Park Zoo, (Massachusetts) – Lack of space breeds contempt. A controversial, multi-million dollar zoo expansion plan was pronounced "dead on arrival," but elephants Emily and Ruth continue to languish in their small, outdated exhibit that even the zoo director, an elephant expert, admits is unacceptable for them. They spend at least 15 hours indoors nightly, and even more time inside during the cold, icy winters, resulting in painful chronic foot disease, severe arthritis and chronic pressure sores. These elephants display abnormal behaviors, including neurotic swaying and rocking and hyper-aggression. In 2006, Emily bit off six inches of Ruth's tail, and Ruth has been aggressive toward keepers. 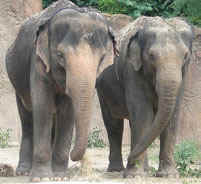 The zoo should invest in upgrading its many other dilapidated exhibits, and let Emily and Ruth live out their lives at a sanctuary. This is the zoo's second appearance on the list. 4. 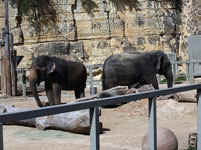 Topeka Zoo (Kansas) – The elephants in the room. 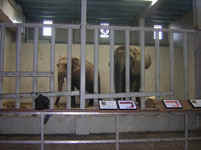 This zoo faces formal charges by the U.S. Department of Agriculture for willful violations of the Animal Welfare Act between April 2007 and July 2011, including providing "minimally appropriate husbandry" for the elephants and failure to inspect their feet as frequently as necessary during a four-month period. Though zoo director Brendan Wiley has been striving to make improvements, in order for this zoo to truly change it must address the plight of elephants Tembo and Sunda, who are living in shamefully inadequate conditions. Lack of space and standing indoors all winter has caused foot problems in both elephants, especially Sunda, who suffers chronic foot disease that can quickly turn deadly. Both elephants neurotically sway and rock. 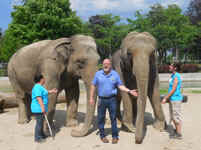 How many more winters can Tembo and Sunda survive confined in their tiny concrete barn? 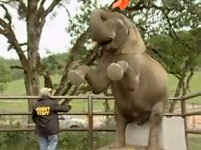 IDA hopes it won't take the death of an elephant to get this zoo to do the right thing and close its elephant exhibit. This is the fourth time that the Topeka Zoo appears on IDA's list. 5. Niabi Zoo (Coal Valley, Illinois) – Nothing to brag about. This small zoo brags that it is the only facility with elephants in Illinois, but it should be ashamed of the grossly inadequate conditions in which it keeps them. Elephants Babe and Sophie have a history of painful chronic foot infections, and one of the elephants had a positive reaction on a blood test for tuberculosis, a serious disease that is transmissible to humans and other elephants. The zoo is trying to raise $4 million to construct a new exhibit that still would be too small to meet the elephants' immense needs. And the elephants would continue to spend the duration of the long, freezing winters inside a cramped barn. Given the possible presence of an infectious disease, it would not be wise to bring in another elephant. Zoo visitors and the animals would be better served if the zoo ended its elephant program and invested its resources in upgrading other exhibits. This is the Niabi Zoo's second appearance on the list. 6. St. Louis Zoo (Missouri) – Everything that can go wrong. This zoo has so many problems IDA is recalling it from the Hall of Shame to feature it again on the list. In 2011, new calf Kenzi failed to make a public appearance for three months after her birth, and gained a mere 80 pounds during that time. This raised a red flag. as her mother, Rani, had attacked and rejected her previous calf. The zoo also started treating 40-year-old Donna for tuberculosis, a disease found in captive elephants; the entire elephant group was likely exposed to this deadly disease. Since this zoo last appeared on the list two calves were infected with a deadly elephant virus and Ellie suffered a miscarriage; a history of chronic foot disease and arthritis due to the inadequacy of the tiny exhibit first landed St. Louis on the list. The small amount of space the zoo plans to add can't make up for the long, cold Midwest winters during which the elephants spend long stretches of time in concrete stalls. Despite miserable conditions and the danger of spreading infectious diseases to even more elephants, the zoo continues its breeding program. 7. Little Rock Zoo (Arkansas) – Two's not a crowd. 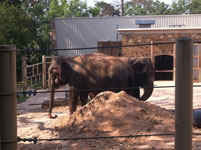 After the death of Mary in 2011, IDA urged the zoo not to seek a cage-mate for remaining elephant Ellen but to instead close its outdated exhibit and send Ellen to a spacious, natural-habitat sanctuary. Instead, the zoo recklessly rushed in two older elephants acquired from the Ringling Bros. and Barnum & Bailey Circus - even though Ellen and one of the elephants were predictably incompatible – in order to meet the required AZA minimum of three elephants. Ellen died less than a month later, and the zoo found itself with two elephants and again out of compliance. With a shortage of elephants in zoos, it's only a matter of time before this zoo is forced to end its elephant program. 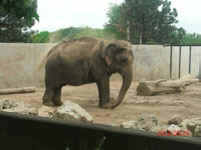 It should save Little Rock taxpayers some money and the elephants a lot of misery by ending its elephant program now. This is the Little Rock Zoo's first appearance on the list. 8. Columbus Zoo (Ohio) – No way to treat a star. Seven-year-old Bodhi, who was shipped to the Denver Zoo in November, quickly fell from star attraction to just another unwanted male elephant in a zoo world that favors females and crowd-attracting calves but is unprepared to house the more powerful and dangerous males. When moving Bodhi, this zoo outrageously implied that his relocation paralleled elephant life in nature. Had the zoo done its homework, it would have known that if Bodhi had been born in the wild, he would have lived with his doting mother and family until he was a teenager. The Columbus Zoo obviously needs a refresher course on the wealth of scientific research that shows just how unnatural life is for elephants in tiny zoo exhibits, especially male calves like Bodhi who are forced to leave their mothers well before it is time. This is the first time the Columbus Zoo appears on IDA's list. 9. Wildlife Safari (Winston, Oregon) – This zoo's a circus! Wildlife Safari made IDA's list for the first time last year because of its "elephant car wash" gimmick, in which the elephants spray water onto paying customers' vehicles and wipe them with sponges. The zoo topped itself this year by hosting events that featured elephants Alice and George "dancing," wearing berets and entertaining the public in a circus-like atmosphere, with the idea that this is supposed to somehow teach people to respect and care about elephants. All the time, the elephants are controlled through use of the sharp steel bullhook - a device used to threaten, and often deliver, painful physical punishment. The new AZA policy against keepers sharing the same unrestricted space with elephants should end these undignified activities that turn elephants into objects of entertainment and do nothing to promote conservation or a better understanding of their true natures. 10. Honolulu Zoo (Hawaii) – Missed by a mile. This zoo recently completed a $12 million elephant exhibit expansion that is so small it’s already out of date. It provides less than an acre of space for elephants Mari and Vaigai, at a time when other AZA zoos are building exhibits three or more acres in size. The zoo plans to introduce a male elephant for breeding purposes, even though Mari is beyond breeding age and Vaigai has previously failed to conceive through artificial insemination. This would unfairly cut the amount of space available to Mari and Vaigai in half. After living in a closet-sized display for so many years, these elephants deserve to have the entire exhibit space. The zoo should forget about acquiring a bull elephant, especially as males are far more dangerous and difficult to house, and focus on providing the best life possible for Mari and Vaigai. 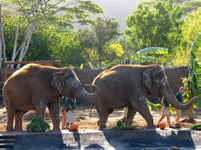 This is the Honolulu Zoo's third appearance on IDA's list. San Diego Zoo Safari Park (California) – Baby elephant mill. Reckless breeding practices have overpopulated an already too-small exhibit and resulted in the death of a female elephant named Umoya, who was killed by another elephant. 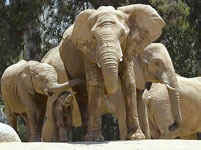 But this "baby elephant mill" will continue to produce as many calves as possible in order to stock inadequate zoo exhibits around the country - even though the zoo has single-handedly aggravated the critical problem of surplus males in captivity by producing eight males calves in the last eight years. As a result, bonded females and their male calves will be traumatically separated from other mother-calf pairs and sent to other zoos; later, the males will be taken from their mothers and sent to yet another zoo in a never-ending cycle of misery. IDA's announces a new inductee to the Worst Zoos for Elephants Hall of Shame – a special category for repeat offenders that have made little or no progress improving conditions for elephants. Past Hall of Shame inductees include Dickerson Park Zoo (Missouri), El Paso Zoo (Texas), and Six Flags Discovery Kingdom (California).